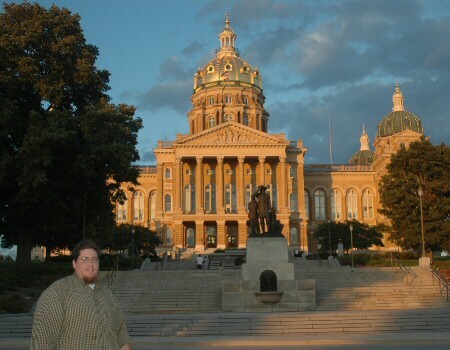 Iowa: Our liberties we prize and our rights we shall maintain. I've spent so much time putting this site together, changing the style, going back and forth and back and forth, reading and rereading every page, that something has really jumped out at me, and it bothers me. If you've read this site this far (unless you're going directly to the page for your home state), you've no doubt noticed it too. And it's really counterintuitive that on a site primarily pertaining to driving around America and visiting each state that it has come up so often. I don't want to say it again, but unfortunately I must. I really didn't get to see much of Iowa. Okay, there, I said it. It may or may not be my fault too. 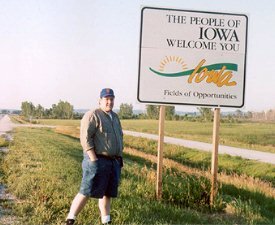 I crossed into Iowa on my way back from the little wheat-and-corn excursion on my Kansas City business trip that took me to Kansas and Nebraska. I was out there for two weeks; the person with whom I went out there was only staying one week and was being replaced by someone else. Alex wasn't arriving until Saturday night, so I had all of Saturday to myself. For 320 miles I could have gone to Jefferson City. Nice, but let's see what's behind Door Number Two. For 400 miles I could have gone to Des Moines. Okay, getting better. Also for 400 miles I could go to Topeka and Lincoln. And for near 600 miles I could go for all three. That would have been a full day. As I had been teaching classes for eight hours a day for five days (and dropping exhausted at the conclusion of each thereof) I didn't head out of Kansas City until about midmorning. I tried, I really tried to get all three in. But through the wonders of photography, it was actually much later in the day than this picture indicated. There would be precious little sunlight left by the time I would reach Des Moines, so I decided to save it for another day. Unfortunately the decision to return to base camp meant that once I crossed into Iowa from Nebraska it would also be time to cross out of Iowa. A few miles east on Route 2, ten miles south on I-29, and I'd already be back in Missouri. Oh well. I'll be back, Iowa. This page loaded in 2.599 milliseconds.